The first card played and we've pulled an ace. Party with friendly faces from around the beer industry. Dance the night away with tunes from disco-party-fun band, Sugar Fed Leopards, and beer from our official Festival Breweries. Old Wives Ales presents a showcase of some of Australia's newest craft breweries in a relaxed atmosphere. This is your chance to meet the next big-names in the beer world, and try free samples of their beers as you chat. Join us in the brewery for a four course game-inspired menu matched with some of our very own handcrafted beers, including one specially brewed for the event. Three course beer and food matching with beers from Wolf of the Willows - including Imperial JSP aged in Lark Distillery whisky barrels. Dishes will be produced using meat from a single pig fed on spent brewers grain from Wolf of the Willows. GBW High Tea returns! Hawkers Beer joins the Metropolitan Hotel for an afternoon of indulgence featuring standout beers and great food. It's a one-of-a-kind high tea experience. Do you remember how much fun you had playing handball at school with your mates?! Well you no longer need to reminisce - Come join the fun as BrewiColo Brewing Co holds its 1st car park handball comp! It’s bound to be a day full of good times and great beers! Join the brewers of Against the Grain and Hawkers Beer for a night at the brewery with live music from The Long Johns (QLD) and Danny Walsh Banned trio. Food and more! We're kicking of GBW19 with a Queensland-inspired party. We'll be pouring new releases, collaboration brews and Park Hotel exclusives from the likes of Balter, Green Beacon, Brouhaha and more. Expect prize giveaways and more! A mini maker's market, coupled with Stomping Ground-matched boilermakers by Four Pillars and coffee by Allpress. Shop ceramics, plants, jewellery and other handmade goods from local artists. Fresh is best! Drink beer straight from the tanks at Blackman's and hang out with the brewing team. There'll be local musical legends playing tunes, paella and games. It's an epic private beer garden party with the brewers. Let the good times roll. Taste Temptress Choc Porter on nitro, Hop Tart, Hop Tart Blush and the latest seasonal release; all paired with a selection of tempting desserts. Hosted by a member of the Holgate brew team. We're back for our fourth Good Beer Week and this one's set to be an absolute cracker! Featuring the best in Victorian breweries, special guests, food too awesome to believe and our favourite live musicians and DJs this side of Mount Macedon. The salty dogs at Sailor's Grave board a bevy of taps and host fun cruise ship games including shuffleboard, ring toss, miniature sailboat racing and more! Prizes galore and Yacht Rock to roar, our nautical adventures are more fun than leave on the shore! Woods of the North is back! Three brewers, three cocktail bars, three barrel aged beers, three cocktail beers, three beer cocktails, three boilermakers PLUS picklebacks, fried pickles, wood-fired barbeque, hot sauce and live music. You do the math. Whitehart wants to know who you think deserves the chance to have their home brew produced commercially and distributed around Melbourne. We'll have six brews from six different home brewers on tap so you can decide who deserves this amazing prize. Burnley Brewing and Green Man's Arms have put their blossoming love to the test with a brew off. The opening party at Burnley Brewing on May 11, will be your first chance to taste and then we will celebrate with a party at the Green Man's Arms on 18th of May. Tallboy and Moose host Boatrocker, 3 Ravens and Brouhaha in a fruity explosion that will blow your mind! A diverse line-up of eight beers have been made using extreme amounts of fruit and all are included in the ticket price. Snack on this Mountain Goat! Snacks and a complete tap takeover with Mountain Goat will have all your tastebuds satisfied! Beers and snacks will be available all day as well as GIANT GAMES. Join us for brunch and spectacular views on our rooftop. We'll be serving up breakfast canapes and specially matched beers from Bridge Road Brewers, including both core and limited releases. We’re kicking off Good Beer Week in style at the Terminus Hotel by hosting our 2nd annual One Night Stand! We’ll be launching and pouring 16 brand new, never before seen, beers from 16 of Melbourne's finest breweries. This year we are ‘Getting the Band Back Together’. All the original White Rabbit and Watts River Brewers are getting together to brew a one-off collab for our joint GBW event in Healesville. For the second year, Little Creatures is bringing together the local beer lovers and creators from the West, from Greater Geelong, The Bellarine, The Surf Coast, Great Ocean Road and beyond with pop-up beer stalls full of delicious ales and lagers. Join some of the best breweries Melbourne's Southeast has to offer like Bad Shepherd, Kaiju, Brick Lane, and 2 Brothers for a micro beerfest showcasing their best brews. What brew will reign supreme! Be prepared for a big night of sake, beer and Kumo's award winning food as we pit Japanese sake and beer brewer Hitachino / Kiuchi against itself to determine the ultimate food match, beer or sake! In collaboration with Sol Invictus and Kustom Kommune, Panhead Custom Ales presents an all-star custom motors crew who will fight the clock to build a living, breathing, beast of a bike whilst you enjoy fresh beers for one hell of a Sunday Sesh. Explore a rising new beer district in the back streets of Brunswick. Visit two breweries (Inner North Brewing, Foreigner Brewing) and three bars (Biff Tannin's, Miss Moses and The Vic) in a bingo bar crawl combining good beer, education, and discovery. GBW is the launch of our 3 Ravens and Beneath Driver collaboration and tap takeover. The Irish Red Ale is designed to pair with our famous Reuben sandwich. We'll have live blues, boilermakers (with optional cigar pairings!) and free canapes. Want to taste some of the world's most highly rated beers? RateBeer is bringing a world first event to Melbourne, sourcing the world's most sought after brews - Review 100 beers on RateBeer for your chance to attend. Consider yourself a budding brewer? Or want to enhance your beer knowledge? Brewniversity is for you! Stomping Ground's Head Brewer will talk you through how to brew one of his creations in your very own home brew kit supplied by Grain & Grape. No Sleep 'Til Brooklyn is back with Part 2! Watch classic NBA games and dunk contests, compete in our NBA Jam arcade comp and enjoy the tap takeover with someone from the New York brewery! NBA singlets are encouraged! Lervig head brewer is coming all the way from Norway to showcase twelve taps of amazing beer from one of the world's hottest breweries. Featuring the beers we all know and love as well as some serious rarities. The guys from Bridge Road Brewers will be pouring some of their finest beer at P49, while we fill you with some of Collingwood's finest burgers. A beer and burger must do. Colonial Brewing Co X Fixation Brewing Collab Brew & Hospo Night! Colonial Brewing Co and Fixation Brewing take over the bar at Hats and Tatts with a exclusive collaboration brew. Ever wanted to run simple tests on your beer at home? Thinking of culturing up you own yeast or bacteria? Our resident microbiologist and yeast wrangler, Ruth Barry, will guide you through a selection of easy access equipment and where to get them from, as well as how to get the most use out of running a small beer laboratory at home or at work. Have you just done Part 1 of starting a lab? Or do you already have one set up? Join Ruth Barry, Boatrocker's resident microbiologist and yeast wrangler as she teaches you the best techniques of how to capture wild yeast & bacteria, what are the pitfalls, and how to make sure you can safely drink the end result! Experts from Pink Boots will run through tastings of common beer faults while giving you the tools to identify the causes, whether at point of service or in the brewery. Beer by Fixation Brewing, whiskey by Michter's and barbecue by Bluebonnet, paired to be greater than the sum of its parts. It's shaping up to be one hell of a party. The Beer Table: Good Beer Week Edition. A super-sized version of our bi-monthly standout dinner. Five courses with beer pairings and a Cicerone assigned to each table. Hosted by Australia's first Advanced Cicerone, Matt Marinich. Melbourne steak institution the Railway Club Hotel will welcome Stone & Wood for one night only. Pairing four great beers to four courses of premium Australian grass fed beef including Robbin's Island Wagyu and outstanding Angus beef from Bass Strait Beef. HOPS & HERBS: a tap and tastebuds takeover! Hawker Hall and Wolf of the Willows team up for an epic evening featuring a unique Hawker style banquet matched with specially curated Wolf beers and cocktails all championing HOPS & HERBS!! Garage Project take on Stomping Ground in this full tap takeover event not to be missed! Pizza-eating comp, pool comp, tastings and good times will make this a Rumble to remember! Fancy yourself a golfer? Don't mind a beer either? Then come out to the Yarra Valley as Hargreaves Hill and Bentspoke co-host Australia's best craft breweries for an 18 hole Ambrose tournament. Party with 4 Pines Brewing Company at The Boatbuilders Yard with special release Keller Door beers and a meet and greet with the crew. Come down for great tunes, classic bar games and giveaways, delicious food, and tasty brews. Hop Nation and Bakery Hill Distillery come together for one night only. We'll have beer and whisky matching, paired cheese, and more special treats. The ability to identify individual faults and flavours is central to appreciating and brewing good beer. Using industry training kits, we'll be doing blind triangle tests of 12 different faults and flavours. Includes kits, snacks and un-dosed beer. An unmissable opportunity for any aspirational home brewer to have one on one Q&A time with a well established or up and coming pro-brewer. Featuring a speed dating format with the brewers. Samples and a wood fired pizza inclusive. Enjoy a Viking style moveable feast including roving snacks $80 dedicated to all things beast paired to six epic brews (served in horns), from La Sirène. Four world class brew crews go head to head in a showdown with Melbourne's finest to decide just who makes the greatest beer! Who wins? You decide! Join Brick Lane and its community at the iconic Queen Victoria Markets for an evening of fire, food, friends and fresh hopped beer, with Shane Delia cooking up a fantastic array of fine produce on open fiery coals. The Annual Great Northern Takeover will showcase our new Limited Tinnie Launch, some one-off Balter beers and a couple of your old favourites. Loads of prizes and hang time with Head Brewer Scotty Hargrave and the Balter Founders. Gonna be a cracka! Join Boatrocker founder & head brewer Matt Houghton, as we discover what it means to be wild! Wild ales, mixed culture ferments, beers that can defy categorization. Taste modern examples and understand the difference between Brett, Sacch and bacteria and what they can each impart on beer. You say brewery, I say the Bruery! Join us for a guided Q&A with the legendary American brewery, The Bruery. We will be sampling some truly stunning beers from the Bruery, with the opportunity to ask questions about this boundary pushing craft brewery. Henry Sugar teams up with Stone & Wood to present a beer-centric vegetarian degustation hosted by head brewer Caolan Vaughan. Taste through limited releases with delicious plant-based pairings reflecting brew processes and flavour profiles. Moon Dog & Chin Chin presents FEED ME – DRINK ME – BREW ME. Feed on delicious Chin Chin cuisine. Drink perfectly matched Moon Dog beers. All while collectively brewing an exclusive barrel-aged beer that will be sent to you once it has been bottled! Discover the unique ways that beer styles interact with the tastes, from salt, to fat, to sweet, to sour. Two Birds Brewing's Jayne Lewis takes you on a sensory exploration of beer and food, alongside bites from the Agostino's kitchen. Join us for Coal Lotta Laughs where Balter bring together their award-winning beers with some of Australia’s best comedians and world-class Chef’s Matt Stone and Jo Barrett (Oakridge Kitchen) for a night of epic food, beer and laughs! Are you Melbourne's best home brewer? We've put together a panel of judges to find out. We'll have industry experts talking all things home-brew, and how to get the best out of it. Entrants must submit six stubbies to us two days prior to the event. It’s a bird! It’s a plane!... No! It’s an intimate evening with some super-human brewing talents and if barrel-aged sours are your Kryptonite, the legends behind 8 Wired and North End have got you covered. Join us for a one of a kind experience. When brewing meets distilling... we're teaming up with local legends at the Bellarine Distillery to bring you a night of gin and beer matching, in the form of three rounds of Gin Boiler Makers. Come and chat to the makers and learn about these crafts. It's a good old fashioned Tap Takeover! Come on down and enjoy some live music, tasty beer and an awesome time. Just remember, its a party so "No Flannel, No Entry"
Join Bronwyn Kabboord (formerly of Merricote fame) as she takes you on an in depth exploration of cheese and beer. Bron will discuss the benefits of cheese & beer over wine, why you should eat more cheese, and more importantly, which beers with which cheese. Cheeses and beers included. Beer DeLuxe host a special edition of Share the Rare with the legends at Boatrocker. Founder and brewer Matt, will guide us through six Boatrocker beers from the cellar, with grazers to match. Entrust your senses to Dans Le Noir and Two Birds Brewing, as you are led through a sumptuous beer pairing dinner in complete darkness. A GBW event like nothing else! The evening includes a five course Indian Feast prepared by the talented chefs at the famed Fitzroy eatery Horn Please; expertly matched to a selection of Bridge Road Brewer’s beers; including a special release. Join us and the Wolf of the Willows crew for a Beergustation featuring an exclusive collab brew, as well as three other beers from their portfolio matched perfectly to our Head Chef’s specially designed dishes. Infamous Kiwi Cafe, Ray’s is doing the good ol’ cook up with the loved Liberty Brewing NZ. Bring a little slice of home (New Zealand) to Brunswick. Get ready for full tummies, flowing beers and good vibes. Feral Brewing Co and Howler bring you the ultimate Hop Hog house party. Showcasing eight taps of Hop Hog Variants, this is the ONLY venue where you will be able to get your mouths on such a lineup. Plus a pig on the spit and DJs all night long! Four Breweries. Four classic beer styles. Four Venues. One night. Who is the best imitator? Have the chance to ask questions of the pro-brewers and a marketing expert. Witness a live brew day on a Spark venue brewing system and taste the Burnley beers. Dinner available to order from the excellent kitchen's Italian influenced seasonal menu. Join the crew from Ale of a Time, and three rad guests from Chur, Deep Creek, and North End Brewing. Each brewery offers a unique lineup and have been exciting drinkers on both sides of the Tasman in recent times. It'll be an easy going, choice discussion. You'll be a bloody egg if you miss it. Six tap takeover from Queensland's most explosive brewery. This is your chance to meet team Ballistic and try a multitude of new releases and a Park Hotel exclusive brew! Meet Brewer Glenn and the team as we take you through our latest and finest brews. Seasonal, small batch, barrel aged, sours and more! The beers are on us, so just turn up and enjoy the beauty of Good Beer Week! We're featuring brewers from Foreigner Brewing Co (Brunswick), Moo Brew (Tas), Bridge Rd (Beechworth), Hallertau (NZ) and European icons Budvar Budejovicky and Arcobrau. The official Counter Culture launch party is taking over the GNH. At the event, new beers will be unveiled, you'll meet the Counter Culture team, learn what CC is all about and get key insights from the head brewer. Screw a tap takeover; we're doing a Tank Takeover! Join us for a night of beer, food, music and fun. Try our house brews straight out of the fermenter, brite tank & keg, all while our kitchen dishes out burgers and beer food. Colonial Brewing Co have teamed up with Queensland's Green Beacon Brewing to create a one-off limited edition collaboration to be launched at Penny Young. Come down, grab a slice, meet the brewers, and taste first hand what happens when two of Australia's most exciting breweries create a beer. Join Rob Kabboord (Chef de Cuisine of Quay!!) as he delights with his culinary skills and teaches us with innate knowledge about pairing food with beer. This is beer & food pairing taken to the next level! Beer DeLuxe and 3 Ravens Brewery host the ultimate vegan beer tasting. Celebrating sustainable practices and vegan beer. Taste your way through five 3 Ravens brews, matched with delicious vegan canapés. Red Spice Road Vs Colonial Brewing Co! Enjoy a bespoke menu with matching beers to each course, while Colonial's brewer guides you through each beer. Rupert on Rupert and La Sirène Brewing celebrate the third 'Wild on Wild’. Exploring all things wild in brewing and cooking, expect a memorable night of smoke, fire, spontaneous fermentation and sensory exploration. BINDASS! (cool, excellent). The Rochey & Bodriggy Brewing Co. present BINDAAS! A five course degustation dinner with matching beers, including our first ever collaboration beer, a South Indian inspired sour. Get your first taste here, it’ll be BINDAAS! If you don’t speak Italian, you will soon. Join us for six courses inspired by the best produce from the iconic King and Godfree Deli matched with the innovative and delicious creations of Garage Project. Journey down the Rabbit hole for our annual GBW Dinner at the Geelong Barrel Hall. Join us for a scrumptious dinner paired with a selection of White Rabbit barrel aged delights and our 2019 collaboration beer with Watts River brewing of Healesville. Take a break from serious beer study to let your hair down for a hoedown! The Shady Lady and Bodriggy Brewing Co will be throwin' a hootenany on Johnston St with live country music, cheap tins, pickle backs, and backyard games. Yeehaw! Spend your evening powering through the latest sours from local brewers Holgate; whilst jamming out with the best of your local babes in bands. Need a ride to the AIBAs? Ballistic Brewing and Whitehart will get you there after you've enjoyed a few brews from Ballistic's 'Sleep When You're Dead' series. Tickets include three tap beers of your choice and transport from Whitehart to the AIBAs. The booze coming out of the Macedon Ranges is world-class. Join us for a guided tasting session and masterclass through three beer and gin boilermakers featuring flavours you mightn’t expect to go together! Be there as the year's best beers are announced at the 2019 Australian International Beer Awards, the largest annual beer competition in the world. Previously unreleased beer from the bright tank, fresh tinnies straight from the canning line and a little something that has been kept in the shadows. Tuck into some Low n Slow BBQ while listening to great local talent on our pop up Brewery Stage. Meet the Mountain Goat team for a night of beer and basketball when they take over Transport. You can taste three Goat beers plus a limited release rare breed whilst shooting some hoops. It's Transports shout so grab your crew and join the goat army. Showcasing some of the finest independent breweries from the UK. Drink limited release kegs, meet the brewers and grab some merch. We love showcasing the best Stone Brewing has to offer. This year, an eight-tap takeover full of limited releases, 'Beat Stone at Pool' for beers, and it's Steak Night! Get your hands dirty helping our head brewer, Blake, brew a beer. The venue is open for food and drinks along with special guests from around the Peninsula. South Australian up and coming brewery Shifty Lizard Brewing Co. are coming out and over the border to Retreat into Abbotsford for a Shifty Take over. Deschutes? I want it all! One word comes to mind when you think of Deschutes; everything! There aren't many breweries in the world that can lay claim to world class barrel beers, world class sours, world class pretty-much-everything!! So we thought we might take you on a little journey with Deschutes, drinking a selection of their beers, chatting with the makers and finding out just how they manage to do it all! To celebrate a new limited release, we are shouting the bar at the Duke. Come down for a taste, meet the Little Creatures team and let them buy you a beer. What a great way to knock off work! An intimate tasting of the most sought after back vintage barrel aged & sour releases from New Belgium Brewing in Fort Collins Colorado (USA). Join Kelly Tretter, Senior microbiologist at New Belgium in an intimate tasting including back vintages and fresh seasonal release. Spaces are limited, RSVP now to secure your position. Join Martin Goffin of Red Gum BBQ, Head Brewer from Dainton Brewery and low and slow meat expert Adam North for insights and tastes into the perfect pairing of ethical, quality meat and craft beer. It'll be a night of fun and frivolity as we put both bar and brewery to the test in three head-to-head battles: Sour v Cider, IPA v Cocktail, Barrel-Aged v New. With five paired dishes from our kitchen - it's a showdown not to be missed! For the last six years Mega Dega has been a marquee event, created by the Good Beer Week team. We bring together a mix of our favourite brewers, and pair them with some of Melbourne's best chefs to create a one-off, bespoke dinner. Discover the definitive role different yeast strains play in beer flavour profiles and discover your favourite yeast strain. This unique FREE event is a collaboration between Bluestone Yeast, Tallboy and Moose and the Merri Mashers. We've scoured the cellar, found the secret brewer's stash and want to share it with you. Enjoy an intimate night of Imperial Stout appreciation with tastings of four vintages of Mornington Imperial Stout AND Old Pumping Station, plus plenty more. 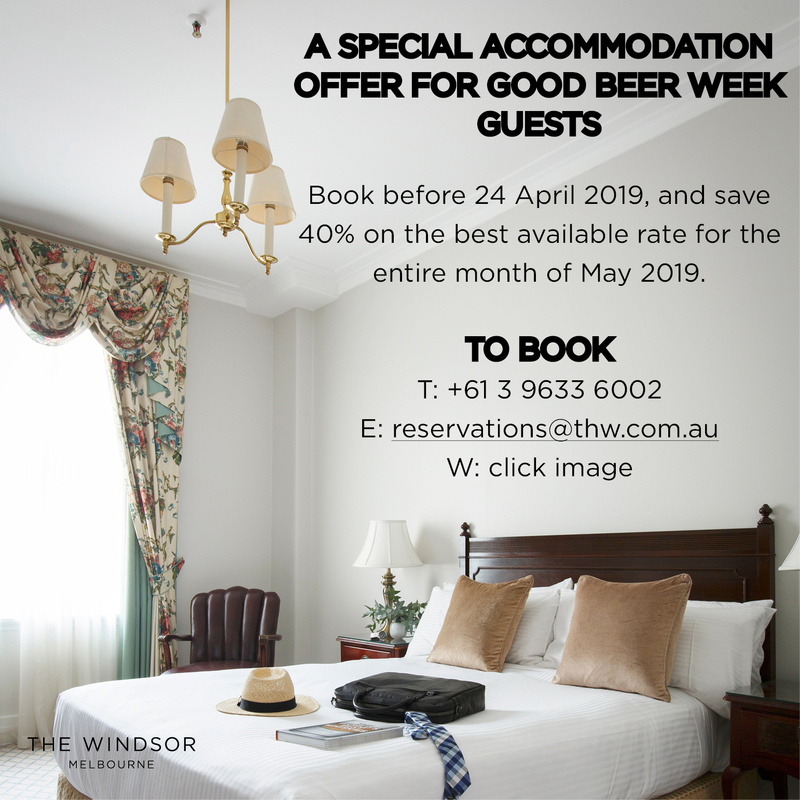 In partnership with 4 Pines Brewery, the Terminus Hotel is hosting a free sampling session this Good Beer Week! Meet and greet the team from 4 Pines, while sampling some of their tastiest wares including a limited-release Good Beer Week drop. Boatrocker have the largest barrel program in Australia, and produce world class sours. Join founder and head brewer Matt Houghton as we talk the how's and why's of production, learn the difference between a kettle sour and a barrel aged sour, and sample a selection of world class sours. Join Brooklyn Brewery & Boatrocker Brewers & Distillers as they give you the lowdown on how to curate, maintain and enjoy cellaring beer. Learn the why's, why not's and how to's with the odd 'ghost bottle' and other rarities. What a way to start your Friday! Join the legends at Bridge Road Brewers, Sailors Grave and Boatrocker for an epic brekkie featuring some of their best sour brews. Kettle sours, mixed ferm & more; matched with equally delicious brekkie food. Melbourne’s homebrew clubs battle it out to find out which club makes the best single hop/single malt beer. The Cryer Malt Trade Hub is your chance to taste the beers and vote on your favourite and it’s a great chance to meet Melbourne’s homebrew clubs. Meat Market, Common Man and Coopers join forces to bring you vintage ales, aged and cured meats and stories from beer educator and Coopers expert Adrian Clark. Enjoy hard to find vintages of Coopers Ale and new releases, complimented by dry aged and barrel smoked meats. GBW Scavenger Hunt is getting so big we have to start at 2pm on a Saturday. Get your team together for an afternoon of figuring out clues, finding random things, drinking great beer and thinking outside of the box. It'll be the funnest one yet. Rock'n'roll, sticky carpet and good beer all day! We proudly bring you a line up worthy of your hard-earned plus four fresh Fixie taps. Doors 2pm. P.S. Entry includes your first pot! Come and visit our awesome new brewery on the Surf Coast for a cracking afternoon of our freshest brews, the best slow cooked American BBQ around, live music and some surf related fun. Your favourite local, The Fitzroy Pinny and Wayward Brewing Co team up to bring a day of sour, tart, funk and barrel aged goodness, a matched sea food menu and live bands to Fitzroy North. The lads at That Little Brewery are taking on the team from Coldstream Brewery in a brew battle! Come along, taste the wares and you decide the winner! Bodriggy busts their new brewpub with a bang. Special guest DJs, five new froffs tapped for GBW and a Cantina menu all under the iron arches of an old mechanic's shop. Celebrate a tropical Hawaiian Luau BBQ with Kona Brewery at Le Bon Ton. It's a four course feast matched with six special Kona brews. Expect a fire scorched menu of tropical flavours paired with music, beer and good times. It’s been a hell of a week, and this is a celebration for all you hospitality legends. You've been pouring beers, cleaning glasses, wiping tables, and nursing aching feet; so to say thanks, Fixation, Brooklyn, Stone & Wood, Michter’s and Garage Project are hosting Kick Ons. Grab a snag from the BBQ, drink a cold beer and join us for a free round at midnight. Come check out our new brewery and tasting room! We will be serving up American hop-forward beers paired with our freshly made in house pizzas. Five beers including a special release batch made just for the event! With up to 180 unique Festival Beers & Ciders, as well as Australia and New Zealand’s best brewers, street food, circus and sideshow acts, roving bands, and even an indoor Ferris wheel, it’s Disneyland for beer lovers. The giants at 3 Ravens Brewery are taking over Mesa Verde, with six of their core range and two special releases! Enjoy delicious tacos designed to match each beer, along with paired mezcal flights for the full Mesa Verde experience! We have asked everyone in the beer industry to nominate their top 10 albums of all time, then we have worked with some of the best breweries in Victoria to recreate a beer to match each album. A pop up record shop playing and selling these albums too. Come and join the Good Drinks crew for a week long beach party in the middle of the CBD! As we transform iconic venue The Workshop into a GBW oasis. There will be beach huts, DJs, live band's, brewers shout's, sandcastles, BBQ's, seagulls and more!! Party times at The Mill Brewery! Good Beer Week is always a hugely celebrated event at The Mill, and this year will be no different! We will focus on games, music and all round amazing times! Ping pong tournaments, trivia nights, live DJs, all accompanied by great beer. A free, week long, FOURTEEN Tap takeover featuring some of the best gypsy brewing in Australia. Expect offerings from CoConspirators, Old Wives Ales, Valhalla, Coburg, Venom, Brewmanity, Pact, Shenanigans, Little Alchemist, Pixel and many more. We transform into the Modus Operandi Home base for the duration of Good Beer Week 2019. In this week long takeover enjoy 8+ Taps of expertly crafted Modus Brews, dinners, tastings, and more. A week long showcase of the Sunshine State's finest beers and breweries. Expect daily tastings, meet the brewer sessions, food specials and a Queensland inspired soundtrack. Melbourne has the best and most diverse brewing scene in Australia and here at the Terminus we're damn proud of it. Join us as we celebrate, drink & showcase all the best Beers & breweries Melbourne has to offer. Join us for another week long event as we celebrate South Australia's oldest and newest craft breweries. 18 taps, nine days, food specials and free entry. The Cherry Tree combs the far reaches of our premier brewing state to bring you the finest eclectic beers regional Victoria has to offer. Come taste the bounty of over 60 beers across 23 taps. Soak up the bounty with regional tapas, changing daily! For eight consecutive years we have been the honoured venue for PoO Sydney. We'll turn over all our taps, host our famous brewers beergustation dinner & hold other unique events to highlight as many of the craft brewers of Greater Sydney as possible. Showcasing the best craft beer coming out of Asia we will feature Young Masters, Hitachino, Great Leap, Pasteur Street, Yardley, Brothers, Coedo and many more. Freddies is host to the United Kingdom! Wales, Scotland & Englands craft breweries will be well showcased, with 40+ specialty froths planned for your drinking pleasure during the week! Miss Moses is stoked to present the very first 'Australian Territories Pint of Origin'. We'll be pouring the very best from the ACT and NT including rare favourites and breweries making their Victorian debut. The Dan O’Connell is proud to present its first Pint of Origin. Regional NSW has been producing some fantastic beers recently and it's our pleasure to showcase them here. Meet the brewers, drink their beer, find out what NSW craft beer is all about! Get immersed in a six course feast featuring the best of craft beer from Oregon, USA. Head Chef Paul Kasten will be matching six courses with six handpicked brews from breweries such as Breakside, Upright, Block15 & many more! Stick that in your Smoker and Hop it! Collab dinner between Fancy Hanks, Fixation Brewing and New Belgium Brewery celebrating everything IPA! Come down for a night of beers, brewers and gut busting food. With your last course served on Good Heavens Rooftop. Join Boilermaker House and Modus Operandi as they explore modern day and old school beer and food philosophies. This epic five course feast will be paired to five beers, each course with a different focus: hops, malt, yeast, water, and whisky. Join in the fun as we Ferment and Fromage with the best in the business. Featuring brews from the legends at La Sirène paired with cheese from L'Artisan. Join us as we celebrate Odin's Day Feast 2.0 in collaboration with Garage Project. Enjoy four courses by Mjølner Melbourne Head Chef Andy Wright matched to four epic brews from the Garage Project crew, each served in horns in true Mjølner style. Join owner/brewers Ian and Shane for an inside look at their new farmhouse inspired brewery. The intimate event will include a cheese pairing with a selection of their farmhouse and sour beer along with barrel sampling direct from the cellar. Be a part of Australian beer history as we brew a one off beer for our 20th birthday. Join us on April 6th for a day on the tools at the Holgate Brewhouse, then it’s back to the ‘Gate in the evening of May 14th to tap up the first keg! Your wildest beer dreams from Brooklyn Brewery are back in 2019. A special guest from Brooklyn, and Whisky & Alement owner Julian, will present the latest and greatest boilermakers. Pairings so good an artist will capture them in art. Molly Rose, Bridge Road and Wildflower have each paired up with a winemaker to make a beer and a wine. Come and enjoy four delicious beers and wines matched with tasty food and a bit of light banter from some of the talented producers who will join us for the night.